The biggest adjustments to the original MR18 IC market forecasts were to the memory market; specifically the DRAM and NAND flash segments. The DRAM and NAND flash memory market growth forecasts for 2018 have been adjusted upward to 37% for DRAM (13% shown in MR18) and 17% for NAND flash (10% shown in MR18). The big increase in the DRAM market forecast for 2018 is primarily due to a much stronger ASP expected for this year than was originally forecast. IC Insights now forecasts that the DRAM ASP will register a 36% jump in 2018 as compared to 2017, when the DRAM ASP surged by an amazing 81%. Moreover, the NAND flash ASP is forecast to increase 10% this year, after jumping by 45% in 2017. In contrast to strong DRAM and NAND flash ASP increases, 2018 unit volume growth for these product segments is expected to be up only 1% and 6%, respectively. At $99.6 billion, the DRAM market is forecast to be by far the largest single product category in the IC industry in 2018, exceeding the expected NAND flash market ($62.1 billion) by $37.5 billion. 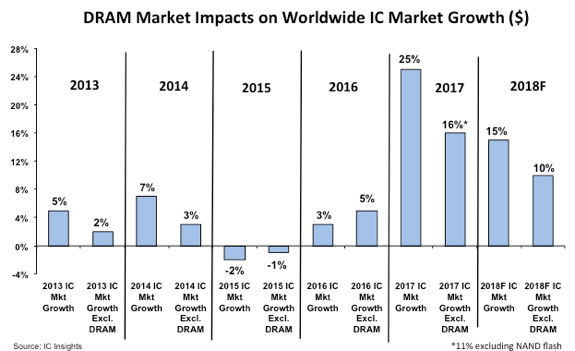 Figure 1 shows that the DRAM market has provided a significant tailwind or headwind for total worldwide IC market growth in four out of the last five years. The DRAM market dropped by 8% in 2016, spurred by a 12% decline in ASP, and the DRAM segment became a headwind to worldwide IC market growth that year instead of the tailwind it had been in 2013 and 2014. As shown, the DRAM market shaved two percentage points off of total IC industry growth in 2016. In contrast, the DRAM segment boosted total IC market growth last year by nine percentage points. For 2018, the expected five point positive impact of the DRAM market on total IC market growth is forecast to be much less significant than it was in 2017.